'Masterclass! is the seventh title in our ‘Playing Yamaha’ series and, building on the success of the Easy Keyboard Library workshop series (featured in the Yamaha Club Magazine), the DVD sets out to show you how, with a few common sense ideas (and a bit of practice), you can turn a fairly simple lead-line and chord symbol music score into a professional sounding arrangement. The DVD features lots of music - and lots of tips to pick up along the way. You’ll be surprised how a small change to the way you arrange and play your keyboard’s voices and styles can make a huge difference to the way it sounds. The ‘Masterclass’ workshop was recorded using a Tyros4 with just one footswitch connected... yet any playing and operational suggestions made during the programme will relate equally to all the instruments listed below. All of the sounds and styles used are part of the Tyros4’s specification when new and many of these are shared by most of the instruments in the Yamaha keyboard/Clavinova range - although the registrations used were created in advance of filming. Note: The subject of registrations has been covered in earlier tutorials in the Playing Yamaha series. ii)The dots: The way written music looks on the page - and how it can be interpreted differently for a more ‘musical’ feel. i)Recognising styles of music - and some tips for choosing an appropriate accompaniment ‘Style’ and voice(s) to match. ii)Intros: Built in ‘Intro’ patterns - how to use (and avoid) them by creating your own intro section to suit the tune you’re playing. iii)Voice & style changes: Ringing the changes regularly in the melody and accompaniment keeps your performance sounding fresh and interesting. i)Repeats & key changes: Easy tips for extending a short, simple tune. ii)Making the most of your instrumental voicing: The terminology of Yamaha’s voice categories - and what it means in musical terms. iii)Using registration sequences: Dealing with fast registration changes. iv)Hidden sounds: Switching between voice sections to create the illusion of a ‘virtual multi-track’ performance. The DVD finishes with a selection of ‘extras’ including out-takes and information about CDs and other DVD`tutorials. Our online shop does not calculate overseas postage charges. 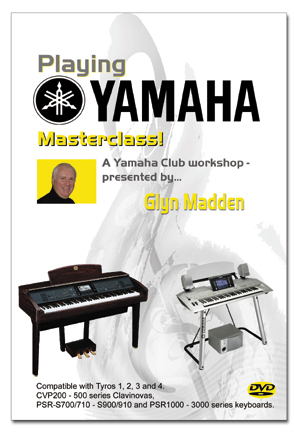 Please email us on info@yamaha-club.co.uk for a PayPal invoice. Yamaha keyboards: PSR-1000, PSR-1100, PSR-1500, PSR-2000, PSR-2100, PSR-3000, PSR-S700 and S900 series, Tyros 1, 2, 3, 4 and Tyros 5 keyboards. * The 'Masterclass!' DVD is available in PAL (region free) format only.